For more information about this topic, check out Mike Lowe’s accompanying YouTube stream. Madden 17 is easily the best Madden ever made, and the numerous threads and stories already floating around Operation Sports — mine included — have been praising the game even before its official release. 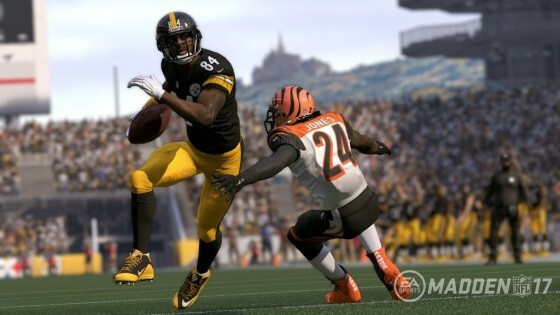 So how can Madden 18 be an even better experience next year? First and foremost, I think it starts with Connected Franchise mode. 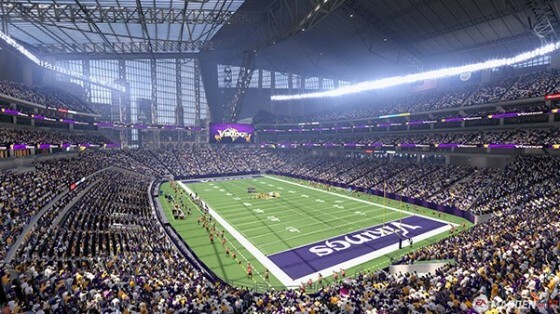 So here’s my top five things I’d like to see in Madden 18‘s Connected Franchise mode. This topic could be its own story in and of itself. The injury system in Madden has been the one true arcade element in a game that has — luckily for us — really focused hard on being more of a simulation football experience. What Madden 18 needs is an injury system not 100 percent dependent on the collision system as it is now. You’ll never see an offensive line injury in a fully played game, unless that lineman recovers a fumble, gets tackled and then gets hurt. 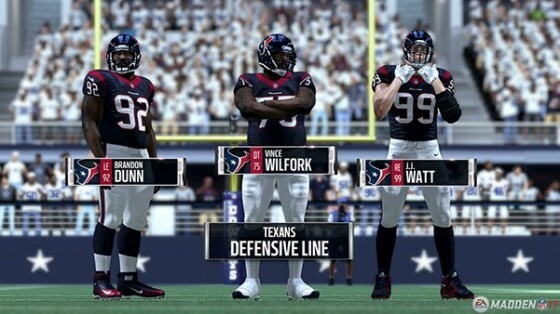 It’s not the most realistic experience, and it does have an impact on CFM because there’s no real reason to worry about depth on your offensive line. Aside from the system overhaul, Madden 18 should include a weekly designation system where players are listed as either out, doubtful, questionable, probable or healthy. Throughout the week — perhaps in a mode where we sim not on a weekly basis but day-by-day throughout the week — an injury status can be updated, and could even improve or regress as you creep closer to kickoff. 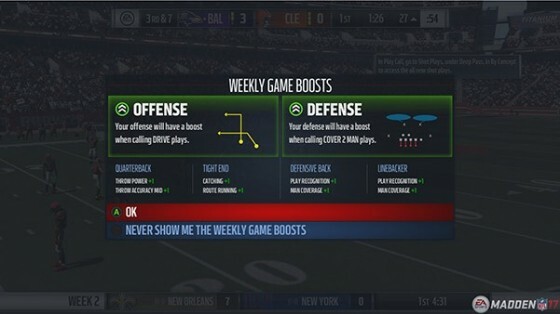 I actually really like the new game planning features in Madden 17 as they are a nice blend of “important but not overwhelming.” Where I could see Madden 18 expanding on this would be in the depth of information being delivered, and by whom that information is delivered. As I mentioned above, having a day-to-day sim instead of a weekly sim would not only allow for some streaming of information about injuries, but also in regards to game planning. This would then prompt you with a decision to either confront Tony Romo, risking upsetting him (personality traits, please! ), or you could take your chances with what may or may not be an increased injury risk, but leaving Romo’s respect for you intact. 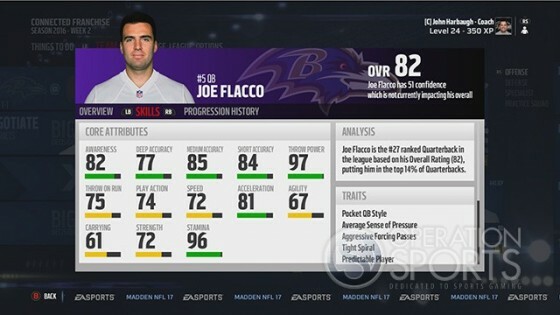 However, the real focus on expanding game planning would come later in the week when you receive a game planning report from both your offensive and defensive coordinator — people who should be actual characters in CFM. These reports would deliver information such as your opponent starting a rookie backup at right tackle and how that can be exploited in your defensive game plan. Your offensive coordinator might then tell you that your opponent’s top two cornerbacks are out this week, and that you should focus on exposing their depth in the defensive backfield by running multiple receiver sets. There are many options that can be worked in, especially if we see a reincarnation of EA’s Head Coach daily sim schedule that even had travel days schedule for Fridays. Do you give your team free time on the flight, or are you having another film session mid-flight? The news section is probably the biggest eye sore in the entire Madden 18 CFM experience. The news screen is something I don’t even click on anymore because all it looks like to me is a bad dating site with a bunch of profile pictures and one-liners. Instead, let’s see a weekly highlight show showing us actual game action from all 16 games around the league. Show me top plays, top performers, box scores for every game, playoff pictures, previews of the upcoming draft and drama around the league (another perk that could work well in using a daily sim schedule and player personalities). During the week, let’s hear the radio show that Madden used to have, and could update even on a daily basis as new stories are being developed through the week. For a league with 32 humans, allow for members of the league to make their own shows streamed straight from YouTube. Positional matchup locks such as locking your CB1 on their WR1 no matter where he lines up. Make the system smart too — it should know the difference between a preseason game and a playoff game where you or the AI are more likely to start that injured superstar. Fumble recoveries being counted as doubled in simulated games (accurate on the player screen, doubled in the team stats screen). Kicker (and punter?) stats not showing up from played games. Kickoff stats not being recorded if you use your punter on kickoffs. Simulated games still thinking the kickoff line is the 30-yard line (only about 25 percent of simulated kickoffs are touchbacks). “Thrown At” and a handful of deeper statistics simply not being tracked in played games. So what do you think of these potential additions to Madden 18’s Connected Franchise mode? What else would you like to see the Madden team work on for next year to enhance Connected Franchise mode? You can follow Mike Lowe on Twitter @mikelowe_OS and on YouTube.